I heart books. Yes, I did get a Kindle for Christmas, and yes, I do intend to read lots of books on it, but there’s something about the feel of a book in your hand that an electronic device just can’t replicate. 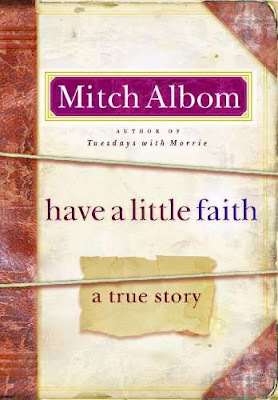 Have a little faith by Mitch Albom is a wonderful book. From its book jacket made to look like an old prayer journal to its ragged pages — it is a beautiful specimen. Oh, and the writing is good, too. The story begins when Albom’s aging rabbi, Albert Lewis (aka The Reb), asks him to deliver his eulogy. As the title would suggest, it is a story about faith. The faith of Rabbi Lewis, Mitch Albom, and an inner city Detroit street thug/drug dealer turned minister, Henry Covington. But this is not meant to be a book review, I simply wanted to share a passage with you. The owner is desperate for help, so he hires the man. Several weeks pass, and suddenly, in the middle of the night, a powerful storm rips through the valley. Awakened by the swirling rain and howling wind, the owner leaps out of bed. He calls for his new hired hand, but the man is sleeping soundly. So he dashes off to the barn. He sees, to his amazement, that the animals are secure with plenty of feed. He runs out to field. He sees the bales of wheat have been bound and are wrapped in tarpaulins. He races to the silo. The doors are latched, and the grain is dry. My friends, if we tend to the things that are important in life, if we are right with those we love and behave in line with our faith, our lives will not be cursed with the aching throb of unfulfilled business. Our words will always be sincere, our embraces will be tight. We will never wallow in the agony of “I could have, I should have.” We can sleep in the storm. And when it comes time, our good-byes will be complete. Are you able to sleep in a storm?